I’ve been reading a great book telling the experiences of a girl who was born in New Mexico in 1874 and grew up on a remote ranch in that territory. 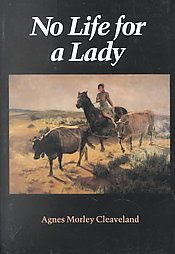 Angus Morley Cleaveland wrote this book, No Life for a Lady, about her own life and what a life it was! She describes a world where children were depended on to run many an errand both near and far. When something needed to be done the answer was, “Put a kid on a horse…” resulting in encounters with bears, outlaws and Indians. How dramatically different her childhood was from her mother’s who had been raised in Iowa to be a lady. How much stronger a woman Angus became because of it. Almost a half a century later Sandra Day was born. She too wrote a book on growing up on a ranch in the southwest. The book, Lazy B: Growing Up on a Cattle Ranch in the American Southwest, was written with her brother. Things had changed from when Angus was young. Cars and trucks were on the scene and fences were more common. But beyond that life wasn’t all that different. Horses were still needed to round up cattle and many other ranch jobs. Sandra relates, “My skill with a horse was not great, but I was not afraid of horses, and I loved to get out around the ranch. I cannot remember a time when I did not ride.” She had to prove to the cowboys that she could hold up her end handling cattle. That ability to hold her own in a man’s world certainly helped her when Sandra Day O’Conner was appointed the first female Supreme Court Justice.